When Shea Baker, freelance writer, picked up a small cluster of knotted threads dropped by an enraged man on his way out of an upscale antiquities gallery, little did he know he would plunged headlong into a mystery of biblical proportions. The threads, later identified as a tassel, purportedly came from the healing cloak of Jesus, a garment that for centuries lay hidden deep in the underground vaults of the Iraq National Museum. 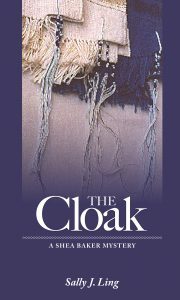 Now, the cloak has been found, and it is about to make headlines around the world as it heals the sick. To some, making this ancient garment available to heal the masses would be an act of compassion. However altruistic, others believe it to be a totally misguided act–one that would instantly fling the world into theological, political, economic and logistical chaos. Set in Iraq, South Florida, and Jerusalem, the story gives a fascinating look at biblical archaeological history and leads the reader on a hunt for the mysterious relic. Along the way, a number of intriguing characters are introduced, each with his or her own reasons for wanting to possess the power of the ancient healing cloak. I wanted to entice readers to dig further into history and the Bible by coupling scripture with a contemporary mystery. As in all Shea Baker books, I wanted the main characters to remain the same while the secondary characters changed. Several of the secondary characters were based upon individuals I met while interviewing people for magazine articles I was writing.